It was a once-in-a-decade display of American firepower. Three US Navy aircraft carriers — the largest, most sophisticated warships in history — assembled off the Korean Peninsula, in a move timed to coincide with US President Donald Trump’s first official visit to the region. But behind the dramatic show of force, questions are emerging as to whether the US Navy is up to the challenges it faces in the Pacific — from both a nuclear-armed North Korea and a strengthening China — at a time when its top leaders acknowledge it lacks the money, manpower and weapons to ensure success. And when a massive corruption scandal threatens the ranks of dozens of its top officers. The three-carrier exercise, conducted in early November with South Korean and Japanese warships, was just one of about 160 multilateral and bilateral exercises performed this year in the area of operations overseen by the Navy’s 7th Fleet, a Navy spokesperson told CNN. That’s about one exercise every two days. And the tempo of operations isn’t slowing. Just two days after the three carriers — the USS Ronald Reagan, USS Theodore Roosevelt and USS Nimitz, and their multi-ship strike groups — wrapped up four days of war games off Korea, the USS Ronald Reagan, with its air wing and three guided-missile destroyers, began a 10-day exercise with Japanese naval units off Okinawa. While the US exercises are intended to reassure Asian allies and to show North Korean leader Kim Jong Un that the United States will not be intimidated by Pyongyang’s testing of nuclear weapons and ballistic missiles, the moves also highlight concerns that the 7th Feet is being stretched too thin. The toll of operations in the Pacific has been grim this year. Two US guided-missile destroyers, USS Fitzgerald and USS John S McCain, suffered collisions with merchant ships, leaving 17 US sailors dead and the two warships needing hundreds of millions of dollars in repairs. The accidents, off Japan and Singapore respectively, also left the Navy wondering how two of the most sophisticated ships on the seas couldn’t even navigate crowded shipping lanes. In total, the 7th Fleet has clocked up five major non-combat incidents in 2017 involving ships and an additional two involving aircraft, including Wednesday’s crash in the Philippine Sea of a plane taking personnel to the Reagan. 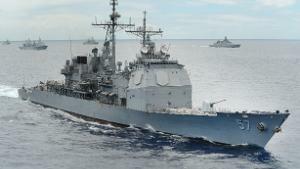 The USS Antietam, a guided-missile cruiser, damaged its propellers and spilled hydraulic oil into the water after running aground while the ship was anchoring in Tokyo Bay. The guided-missile cruiser was struck by a 60- to 70-foot-long South Korean fishing boat while conducting operations in international waters near the Korean Peninsula, the Navy said. The collision between the Fitzgerald, a guided-missile destroyer, and the ACX Crystal on June 17 claimed the lives of seven US sailors. It took place 56 nautical miles off the coast of Honshu, Japan, in an area heavily traveled by commercial shipping. 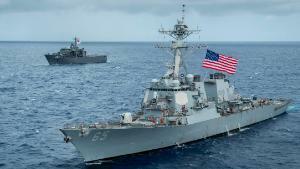 The US guided-missile destroyer collided with a Liberian oil tanker in crowded shipping lanes off Singapore, leaving 10 US sailors dead and five more injured. The accident left a large highly visible hole in the US ship. The guided-missile destroyer USS Benfold was struck by a Japanese tugboat while participating in a scheduled towing exercise off Japan. 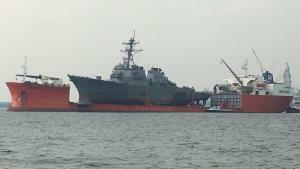 The tug boat lost propulsion and drifted into the US ship, the Navy said. No one was injured. 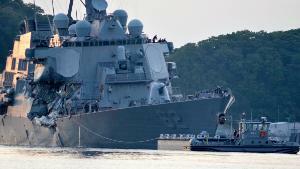 A US Government Accountability Office report from September warned lengthy deployments of US ships based in Japan — as both the Fitzgerald and McCain had been at the time of their collisions — often result in key training requirements being neglected due to the demands of operational duties, something the report describes as a “problem.” Without training time, “perishable skills atrophy,” said Carl Schuster, a Hawaii Pacific University professor who spent 10 years “driving” US warships. “Military commands are like a football team, you constantly have to practice,” added Schuster. Appearing before the House Armed Services Committee as part of an investigation into the series of fatal crashes and collisions at sea, the Navy’s No. 2 officer, Vice Chief of Naval Operations Adm. William Moran, said the Navy is trying to do too much with too little. “We continue to have a supply-and-demand problem which is placing a heavy strain on the force,” said Moran. It’s an opinion shared throughout the naval establishment, where frustrations are mounting as to the rising set of operational demands placed on the 7th Fleet. In a testimony delivered to Congress in September, John Pendleton, director of defense capabilities and management in the Government Accountability Office (GAO), said the Navy was operating on what people in the service call a ‘train on the margins’ approach. That means ships had no dedicated training time but instead fit whatever they could into time on missions, said Pendleton. Exhausted crews can make bad decisions. As Schuster points out, in the case of the Fitzgerald collision, officers on watch did not wake the sleeping captain when the warship got in range of the merchant vessel. “They were either incredibly complacent or sloppy beyond description,” said Schuster. The Navy has launched multiple investigations, a safety pause, and reviews in the wake of the recent accidents. “We are taking immediate corrective actions to ensure we meet the training and material readiness standard to prevent another mishap,” Richardson said. F/A-18 Hornets fly over US and South Korean warships during an exercise off the Korean Peninsula. The Navy’s internal report on the Fitzgerald and McCain collisions, released in early November, said cutting corners to meet demands on 7th Fleet ships had become the norm. Surveys of sailors aboard the Japan-based guided-missile cruiser USS Shiloh carried out between June 2015 and August this year point to severe morale problems. One sailor described serving aboard the ship as being akin to being on “a floating prison,” according to surveys obtained via the Freedom of Information Act by Navy Times. “Even the taxi drivers on base know us for being the ‘USS Bread and Water,'” one survey respondent said. Top commanders acknowledge the Navy may be asking too much of its sailors, ships and aircraft. Testifying before the House Armed Services Committee earlier this month, Vice Adm. Mike Shoemaker, commander of the US naval air forces, detailed the extraordinary lengths the Navy now has to go to send fully equipped carrier air groups to sea, due to the low stocks of working equipment — including fighter jets and trained personnel. “To get Carl Vinson, Nimitz and Theodore Roosevelt ready to deploy in January, June and October of this year, and equip their embarked air wings with the required number of mission capable jets, 94 strike fighters had to be transferred, to and from the maintenance depots, or between F-18 squadrons on both coasts,” said Shoemaker. While this exercise is encouraging, the reality remains that our Navy is underfunded, over-tasked, and too small. In September, Moran said hundreds of parts were cannibalized from some F/A-18s and used on others to get carrier-based squadrons combat ready. The problem also directly impacted the sailors and pilots aboard those ships as the Navy was forced to fill gaps in those deploying squadrons and the three carriers by temporarily reassigning more than 300 sailors or extending their deployments beyond normal lengths, Shoemaker said. Such moves, which Shoemaker called a strike fighter “shell game,” hurt morale, meaning personnel don’t sign up to extend their Navy careers, leaving positions open and years of training and experience wasted. Sen. John McCain, chairman of the Senate Armed Services Committee, applauded the Navy for conducting exercises with three carriers near the Korean Peninsula but also highlighted several of the shortfalls plaguing the service. “Too often exercises like this, which are critical to maintaining tactical proficiency, are sacrificed due to higher priority operations, maintenance delays, or fiscal constraints,” McCain said in a written statement. “While this exercise is encouraging, the reality remains that our Navy is underfunded, over-tasked, and too small,” he said. Navy commanders have previously warned that years of spending cuts have limited the number of usable aircraft and ships — an issue that has only escalated amid increasing demands for US military presence. For the Navy’s 7th Fleet — the largest of the Navy’s numbered fleets — that means staying on watch for North Korean provocations, including having ships on the ready that could shoot down ballistic missiles headed for Japan, Guam or even the mainland United States. Those ships included the Fitzgerald, John S McCain and Shiloh. It also includes freedom of navigation exercises in the South China Sea, where the Beijing government has been building man-made islands, installing fortifications to strengthen territorial claims, and deploying new ships and planes that challenge a long-time US technological edge. And then there are exercises with an Indian military eager for US help in increasing its naval capabilities, watching Russian nuclear-armed submarines deploy from that nation’s eastern ports into the Pacific, and making port calls from Australia to Vietnam to show the US flag and maintain an American presence. In total, the 7th Fleet’s area of operation spans more than 124 million square kilometers, stretching from the International Date Line to the India-Pakistan border; and from the Kuril Islands in the North to Antarctica in the south. We can build up our navy to a level where it can do all of these things without wearing out crews and hardware, or we can ‘pivot’ or ‘re-balance’ more of our forces to the Pacific theater. 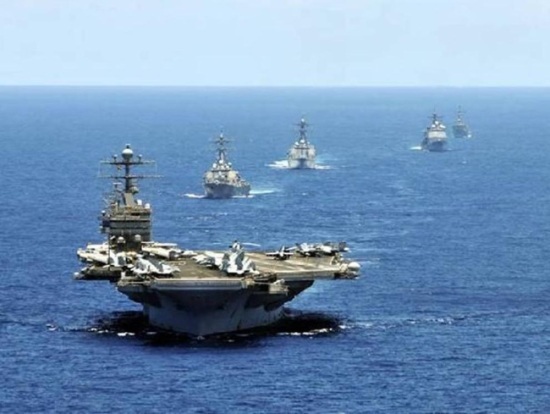 In regard to China, in particular, neither the Obama nor the Trump administrations has shifted forces to the Pacific in sufficient enough numbers or capability, said James R. Holmes, professor of strategy at the US Naval War College. F/A-18 Hornets fly off the carrier USS Carl Vinson off the Korean Peninsula in March. US officials say they’ve had to scavenge parts to keep the F/A-18s flyable. The Navy’s operational problems can be tackled, argue experts. But that is without contending with the biggest corruption scandal in US naval history. The ongoing scandal has seen 20 current and former Navy officials charged so far in a fraud and bribery investigation stretching across Asia. Known as the so-called “Fat Leonard” scandal, the investigation centers on former defense contractor Leonard Glenn “Fat Leonard” Francis, whose company provided services to Navy ships including fuel and tugboats. Since the investigation began in 2013, multiple Navy officials have been arrested and accused of accepting cash, prostitutes and all-expenses-paid trips in exchange for steering ships to ports where Francis’ company operated. In June, Michael Brooks, who served as the US naval attaché at the US Embassy in the Philippines from 2006 to 2008, was sentenced to 3.5 years in prison after admitting to using his influence to benefit Francis in exchange for “bribes of travel and entertainment expenses, hotel rooms and the services of prostitutes,” the Justice Department said. The Washington Post reported in early November that the Navy is reviewing the actions of 440 more active-duty and retired personnel in connections with the scandal. According to the report, sixty current and former admirals are included in the review. The US 7th Fleet this year has participated in about 160 exercises with other countries, including this one with Japan’s Maritime Self-Defense Force. The US Pacific Fleet was first established in 1907, though it can trace its origins back much further to the formation of the Pacific Squadron in 1821. Since then, it has seen its size grow in line with its overall strategic importance, as Asia — and East Asia in particular — became a focal point of US foreign policy. Today the fleet is the world’s largest, with approximately 200 ships and submarines, nearly 1,200 aircraft, and more than 130,000 sailors and civilians. Since coming to office President Trump has set the goal of bolstering the Navy’s overall size to 355 ships, up from its current total of 308. But the goal also means keeping what’s in the fleet in working order — and that’s no easy task. 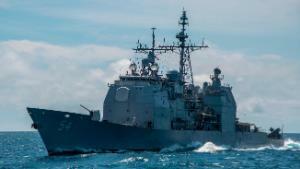 Maintenance delays are currently sidelining 11 Navy ships, a congressional aide told CNN. A September report from the Government Accountability Office found that the Navy’s shipyard facilities and equipment in poor condition with a backlog of restoration and maintenance that will take at least 19 years to clear. Lawmakers have often cited budget caps implemented by Congress and President Barack Obama in 2011, coupled with the high demand for the fleet’s services, as key factors contributing to the Navy’s lack of fiscal flexibility,” the report said. “Inadequate facilities and equipment led to maintenance delays that contributed in part to more than 1,300 lost operational days — days when ships were unavailable for operations — for aircraft carriers and 12,500 lost operational days for submarines,” according to the report. The littoral combat ship USS Coronado fires a Harpoon missile during Exercise Pacific Griffin, conducted with the Singaporean navy. In early November, the House of Representatives passed an annual defense policy bill that — if passed by the Senate — would authorize the full ship maintenance budget requested by the Navy and provide additional funding for more aircraft. “This year’s National Defense Authorization Act will help address this problem by increasing funding for the Navy, including authorizing five additional ships and hundreds of millions of dollars for maintenance above and beyond the President’s budget request,” McCain said in a statement. But while the defense bill is a move in the right direction, the funding authorized won’t fix the readiness problem — an issue that will take years to address, according to Randy Forbes, a former US representative who served as chairman of the House Seapower and Projection Forces subcommittee. And while Forbes recognized the Navy’s need to flex its muscle through exercises like those conducted near Korea, he said the US must address the fleet’s “diminishing surge capacity” as a potential conflict will likely require a response by more than three carriers to carry out the operations plan. To ensure its carrier strike groups are able to respond to an emerging conflict, the US must launch a course to “rebuild the Navy,” Forbes told CNN.